Starting a business, recruiting an employee, want to play a game, want to know the weather outside, time in Paris, how do you make the perfect cheese cake so on and so forth. Today, the demands of people have reached no limits. And the best is that they want an answer within a blink of an eye. This could be difficult since this means expecting a lot from technology. However, with the highly efficient and huge iOS app store, this is a piece of cake for Apple customers. The iOS app store provides its customers with large number of iOS application options to choose from. It has a wide variety of options under each genre, hence, making it easier for Apple customers to choose the best out of the lot. They have the best iOS applications under the bold, beautiful and quirky options! Here are five interesting iOS applications that Apple customers can incorporate with. This application was initially available only for Android users. But how can Apple not have an application that is available in the Android! So now, the Android application, photo sphere camera, provided by Google, is now compatible with Apple models as well. 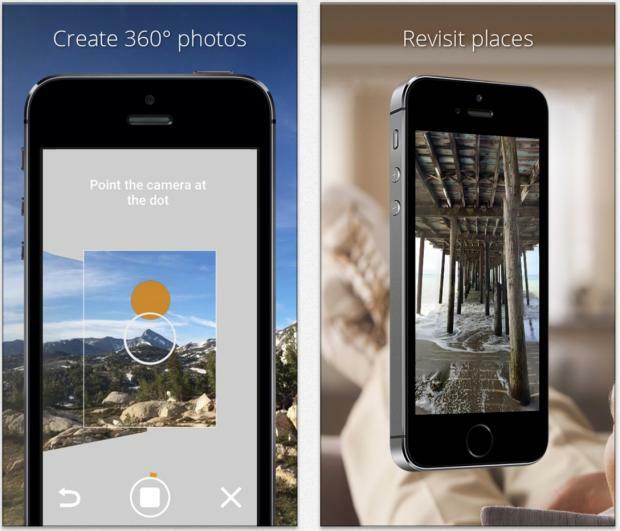 This iOS application allows customers to click a 360 degree angle of a photograph. Customers may seem this to be a repetitive application when compared to other iOS spherical photo applications. However, what makes this iOS application different from others is that Google has worked well with the user interface. These 360 degree photographs can also be published on the social media as well as on Google maps as and when the photograph is clicked using the iOS application photo sphere camera. This iOS application is a brand new addition to the App store. 1ClickRTC application provides developers with the features to create live video chat support applications. This 32bit eco-system supported iOS application, is available on all versions of all Apple models. For example, the iOS application works fine on an A6 or A7 chip as well as the older version of iPad 2’s A5 chip. What makes 1ClickRTC different from all the other iOS applications is that this is done without compensating on the video resolution or quality. The number of concurrent calls provided by the webRTC application depends on the pricing option chosen by the customer. With the basic pricing plan of $15/month, the customer can make a maximum of 4 concurrent calls while with $25/month, s/he gets 8 concurrent calls. However, similar to the web portal, the iOS application too supports a maximum of 14-15 concurrent calls which is provided with the enterprise pricing plan. 1Click’s live video chat on the web portal has become a huge success in the business world. 1Click’s iOS application, 1ClickRTC, is now trying to help developers create applications that will allow mobile customers the experience of face-to-face communication. Recruiting can be an extremely tiring and boring job after a while. The iOS App Store makes the job for recruiters easier and more interesting with the help of this iOS application Tungle. This mobile iOS application helps recruiters with better time management and organizational skills. This application, which is more or less like a to-do list, is highly useful for those recruiters who have too many meetings and schedules to remember. How Tungle works is that the application sends an invitation to the candidate, and if the invitation is accepted by the candidate, the application creates an update on both the recruiter’s as well as the candidate’s calendar. Though this application is listed under iOS applications, it is not an exclusive in the iOS App Store. Have you ever come across this situation where you see a place, think of coming back later but later forget where the shop was located? Well, that’s where MapHook helps you out. What this iOS application aims to do is to act like a journal where every customer can bookmark every cool landmark, photo, location and video. These information can later on be shared with friends on the social media. This helps people browse through a large collection of public libraries and explore the city better. Next time all you Apple users see a cool street art, or an amazing cafe or a t-shirt you would like to buy, make sure to map the location on your phone using the MapHook. Ever had an awkward situation where you run into your ex-boyfriend/girlfriend? Or have you run into your boss on a pretended-sick-day when in reality you were having a good time with your friends? Well, ensure you don’t run into any boss, ex-co-workers or any of those awkward situations with the help of the Cloak iOS application. This application loves to be known as the antisocial network and integrates with the customer’s FourSquare and Instagram profiles. By doing so the application lets the customer know the whereabouts of his/her friends, non-friends, to avoid any untoward situation. An interesting feature of the iOS application is the ‘Hate Follow’ option, where customers can follow those s/he hates and know their location at all times. Though the iOS application is supported only with FourSquare and Instagram for the time being, very soon the Facebook application too will be incorporated with it. So here are five of those interesting iOS applications for every Apple user. Make sure you try out all of these to ensure complete and proper use of your Apple product. This entry was posted on September 24, 2014 by Deepthi Ramdas in Technology and tagged iOS application.